Republished from Ipswich Yesterday by Alice Keenan, 1982. Photos by George Dexter and Edward L. Darling. 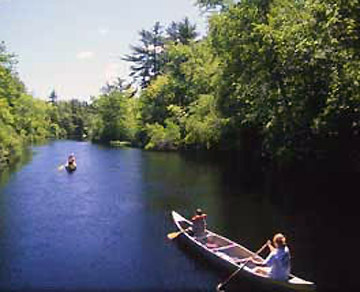 Ipswich has the habit, long ingrained, of turning on those who love her most, and who, innocently and willingly, donate their time, talents, energies, and in some cases — money — for her welfare and adornment. Sometimes the reprimand is delivered by a not so gentle slap on the wrist, but other times the bewildered recipient of her displeasure is savagely pole-axed and permanently numbed. Some lick their wounds to rise and fight again, but others, perhaps the wisest, say t’ hell with it and settle back in comfort to watch the on-going side-show. 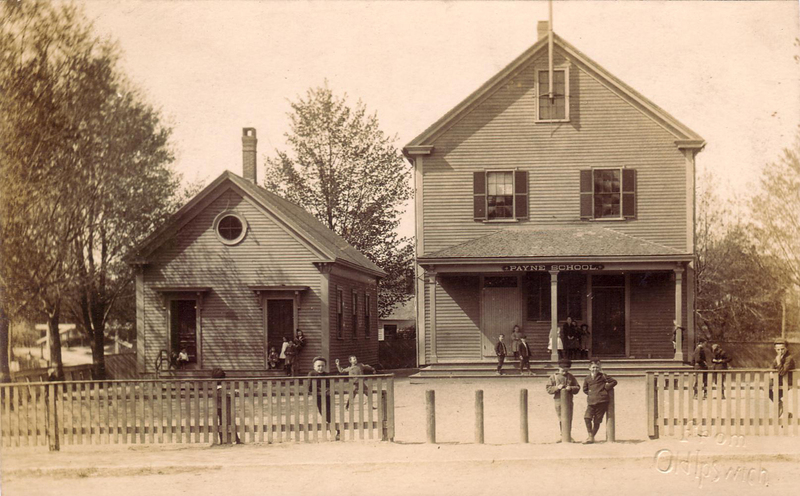 The great Ipswich put-down is not a recent phenomena, but has been going on ever since Winthrop Jr, waded ashore with his not-so-merry men, evicted William Jeffries and beguiled and bedazzled poor old Masconomet. Nor does she distinguish between the rich and the poor, the learned and the dummies, the powerful and the not so mighty — when the mood is on her they all feel her wrath — vicious and scarring. Life was rosy for Mr. Oakes until he took that fateful walk up High street and decided to drop into the little school house on Lord’s Square. Dr. John Manning and his High street neighbors had already fought and won the battle for the school — the nucleus for the present Payne School — and we imagine that Mr. Oakes had contributed one way or other for its support . “A man of taste and order whom nothing annoyed more than to witness things at sixes and sevens,” Mr. Oakes decided that although the children were doing well, their materials and supplies were appalling and immediately set about straightening things out. The very next week there arrived at the school a complete set of writing books, several dozen of ink-stands to replace “the multidudinous forms and sizes made from lead, soap-stone and potters ware,” a gross of imported quills, replacing the goose and turkey quills “as difficult to split as the chip of an elm,” and innumerable other little goodies — all paid for by Mr. Oakes. The cruelest thrust of all was the slanderous and vicious whispering campaign questioning his motives for aiding the school, “that so upset and soured his mind that he withdrew his support forever.” He was not forgotten, for 40 years later a faded news clipping tells us that a picture of Mr. Oakes has been uncovered, “he whose memory still reflects credit and honor on our town and whose fame brightens as the years roll by.” The Essex Institute, we are told, will honor the memory of its first resident botanist by publishing a sketch of his life in its next series of collections. Fame is fame and can be sweet, but we wonder if Mr. Oakes ever recovered from the shabby treatment he received from his townspeople — for he died a short time later. 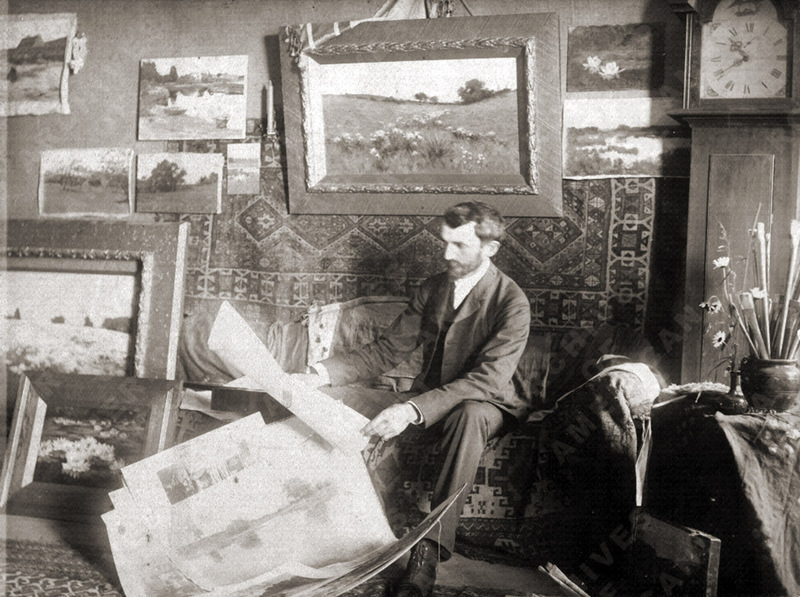 Oakes may have been regarded as an outsider, but what of Arthur Wesley Dow, artist, teacher and historian — a true blue chip off the Puritan block, whose ancestors had lived in Ipswich since the 1640’s — well flowered throughout the. years by various Kimballs, Lulls and other impeccable Ipswich stock? Born in the old Matthew Perkins house on East street in 1857, Arthur Dow, sensitive and artistic was always considered to be a bit of an exotic by the natives, and even more so when he became internationally famous. 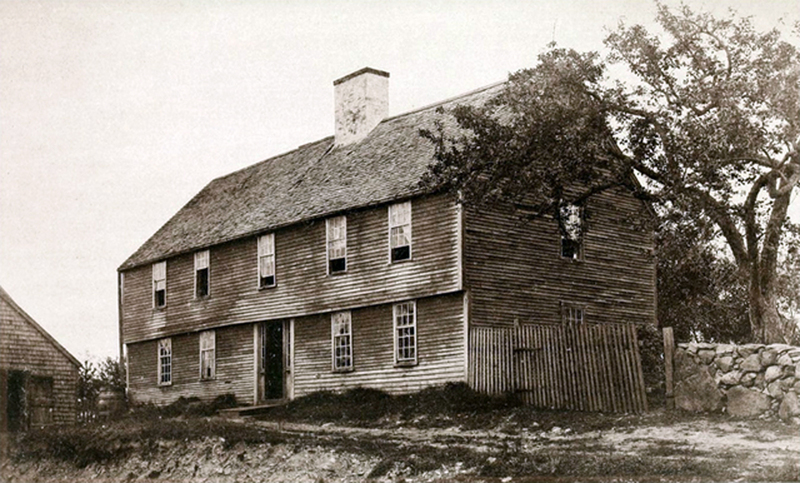 As a youngster he was suspect, and the gossips watched as he sketched and dreamed over the old houses of Ipswich — the old houses he loved so much as a boy — and lacy for us — that interest continued throughout his life for he became a driving force behind the formation of the Historical Society. He loved Ipswich and gave it far more than he ever received. Arthur Wesley Dow’s summer art school was in the “Emerson-Howard House,” on Turkey Shore Rd. Returning to Ipswich and the usual “so what” attitudes, he bought the old Emerson-Howard house on Turkey Shore, restored it, and established the highly successful Ipswich Summer School of Art that would eventually attract more than 200 pupils seasonally and set the cash registers of the locals ringing. The town fathers decided to get into the act and tax all of the unsold paintings and materials in his Bayberry Hill studio. They hastily withdrew their demands when their ridiculous move generated much unfavorable national publicity, and then, with true Ipswich inconsistency, asked Dow to design the town seal — for free — still our official logo. It was Arthur Dow who was responsible for introducing Japanese art to America. Fascinated by the oriental process, he visited Japan, was warmly received and studied there. Somewhere in that country there is a small memorial erected to his memory — “Dow, the friend and artist.” To this day his name is a familiar one in Japanese art circles and young students from that country still visit Ipswich — to view his house and Bayberry Hill. A teacher of note, he died in 1922 while heading the art department at Columbia University — and the re-awakened interest in Arthur Wesley Dow, the artist, is a tribute to his genius. 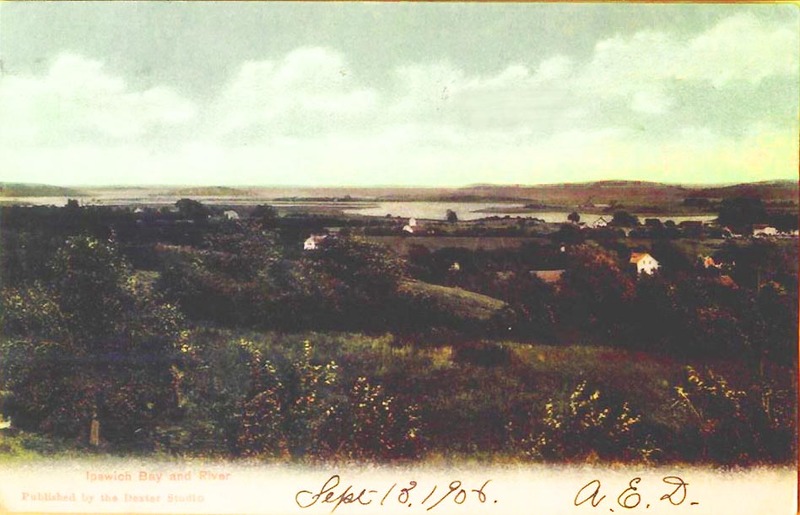 The town of Ipswich refused Arthur Wesley Dow’s bequest of his property on Bayberry Hill at the top of Spring St.
A similar fate awaited Mrs. Dow’s generous bequest, to the town, through the Ipswich Public Schools. Mrs. Dow offered several of her husband’s paintings only to have them turned down because “the town couldn’t afford to buy the frames.” A local Dow admirer offered to pay for the frames and the town rather reluctantly accepted the generous offer. A similar fate seems to await the Emerson-Howard house on Turkey Shore road. Originally purchased by the Dows to save it from being torn down, they restored it, lived in it and ran the famous Summer School of Art. When Mrs. Dow died she left it to the Society for the Preservation of New England Antiquities “to be forever a memorial to the family of Emerson which produced so many splendid descendants,” Ralph Waldo Emerson for one, “and as a memorial to Arthur Dow who saved it from destruction.” The S.P.N.E.A. is presently engaged in trying to unload the property, although some legal ramifications intervene — and we imagine that in time the primary purpose behind Arthur Wesley Dow’s generous gift to the public will be lost forever. The grand plans for Dow Park have come to naught — the beautiful area reduced to a tangled mass of briars, poison ivy and brambles — the memorial boulder almost impossible to find — and his studio burned to the ground many years ago. Putdown? Just remember the pigmies — it helps. Times don’t change! Lots of stupid people still out there! Thanks for posting !